Before I put away the anchor chain that was delivered yesterday, I decided to go ahead and mark the chain lengths every 50 feet with bright fluorescent paint so I can tell how much anchor chain has been deployed when anchoring, roughly. 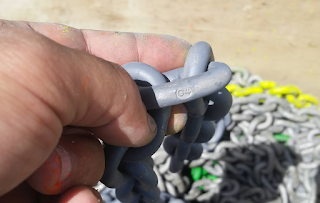 There are a variety of ways of marking your chain lengths but really the most practical is just to paint the chain every 25 or in my case 50 feet. The paint won't last long as the water and sand will remove most of it off the outside of the links quickly but small patches in between the links will last longer and are sufficient to provide a visual indicator of the anchor chain lengths being deployed. 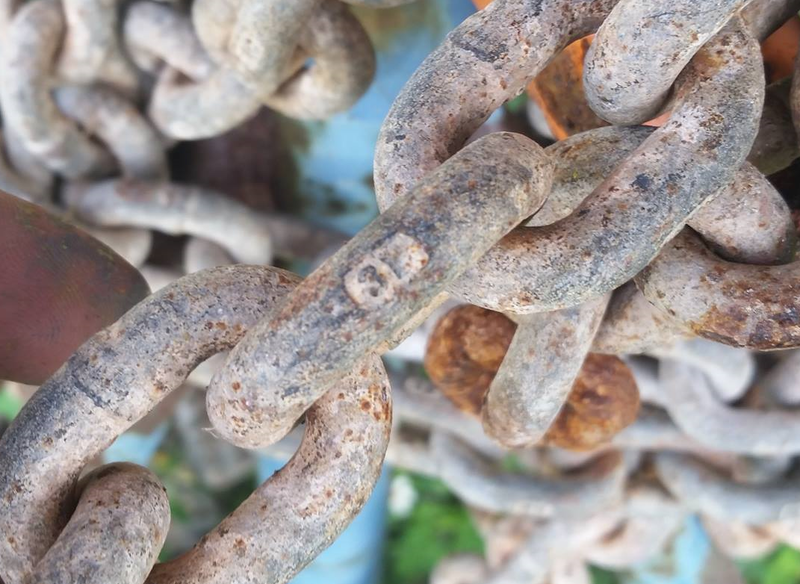 The previous anchor chain was just a few feet of BBB grade chain. I have switched-up to G4 grade chain which should last a bit longer. I took advantage of Defender's warehouse sale to update my ground tackle. My newly-built and quite spacious anchor locker has room to store some serious tackle, and after surviving through two hurricanes (plus a near miss) in two years has convinced me to get the heaviest-duty ground tackle I can fit on Whimsy. Whimsy's original ground tackle, consisting of a Bruce claw-type anchor, a few feet of 5/16th chain and about 100 feet of 3/4" three-strand, and a Lofrans manual windlass, was more than sufficient for the sort of easy coastal cruising she was used for by the previous owner. Since Whimsy only draws 3' 9" with the centerboard up, it is easy to anchor in quite shallow areas off-limits to most other cruising vessels too. 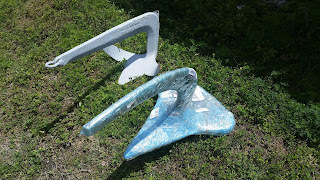 This set up was fine for gunkholing in the Bahamas and Keys but more distant anchorages are not nearly as shallow and easy-to-anchor so I decided to get some serious ground tackle suitable for a long-distance single-handed cruiser. First, the windlass: Anchoring single-handed is hard enough without having to try to wrestle with a manual windlass. I decided to go with a Lewmar H3 horizontal windlass with a chain gypsy and a drum. 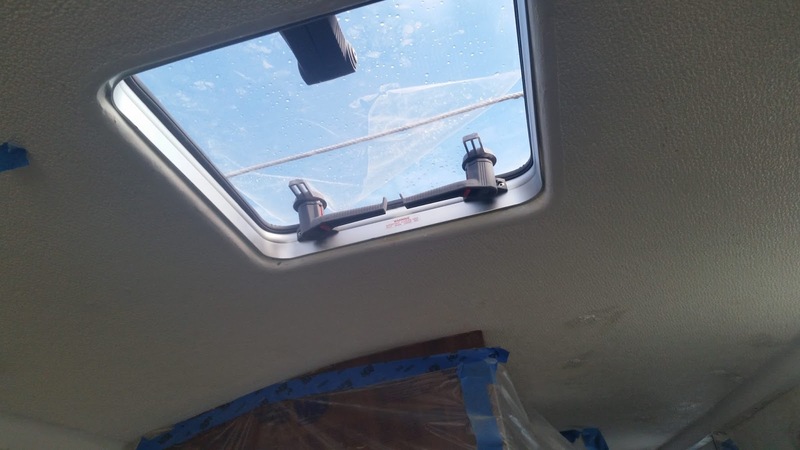 I am not a fan of vertical windlasses for a variety of reasons, and I don't think the under-deck mounted motors are really much of an advantage than the sealed units mounted above-deck, corrosion-wise. The Lewmar H3 is a well-regarded and established model, that came with its own remote switch too. The weight wasn't thst much more than the manual windlass, and once the chain is moved to the bilge before departing on long-distance voyages, I don't expect there to be much of a difference in performance caused by the weight of the new ground tackle. 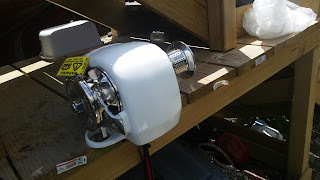 Updating to a power windlass, means I can upgrade the anchor rode to take the best advantage of its pulling-power, With an estimated max pull power of about 1700lbs, the Lewmar H3 allowed me to move up to 200-feet of 5/16th all chain rode. The deepest anchorage I expect to use in the Bahamas and Keys is no more than 15 feet deep, and adding 5 feet to that from the waterline to the deck, plus a favorable 7-to-1 scope when deploying the anchor, means that I can expect to use 140 feet of the chain, with 60 feet in reserve, max. 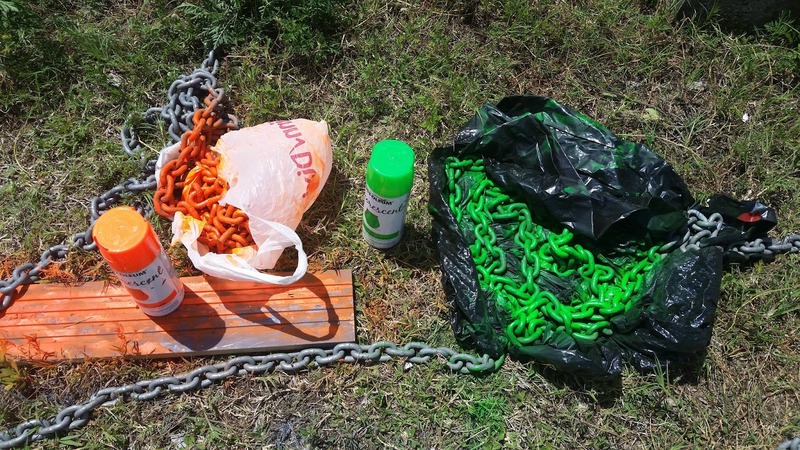 More likely, at 10 feet depth and a more usual 5-to-1 scope, I would only use the first 75 feet of chain only. But in other places in even the Caribbean, never mind the PNW, anchorage depths can very easily be more than 50 feet. 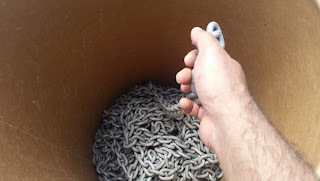 So in addition to the chain, I have 300 feet of 5/8th 8-plait line. That combined with Whimsy's shallow draft, should suffice to keep her anchored safely in a blow and allow me to rest more comfortably. 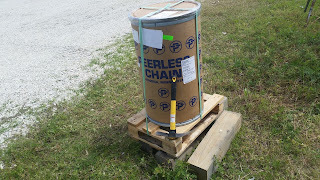 I went with G4 hi-test chain (which is not the same thing as high tensile) - Peerless Acco-brand chain, to be specific. 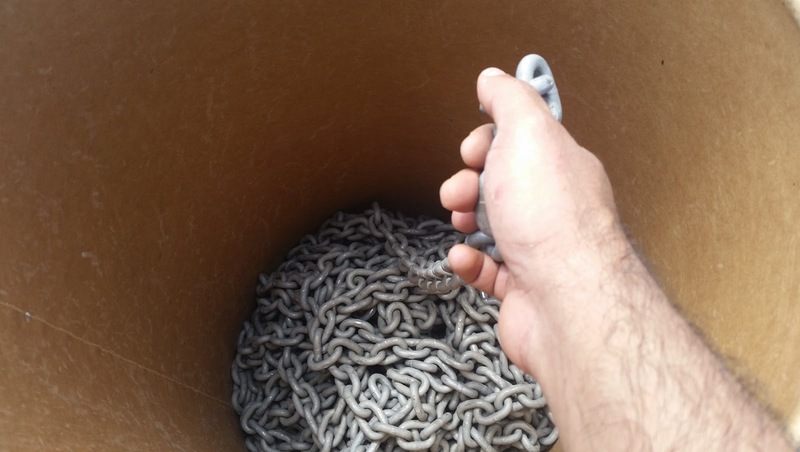 I'm hoping the galvanization of the brand name chain will hold up better than cheaper, no-name windlass chain. The weight of 200 feet of 5/16th chain comes out to about 210lbs. Combined with the 44lb Rocna Vulcan anchor, that comes to a total weight of say 250lbs, comfortably within the Lewmar H3's pulling capacity. I also got a Rocna Vulcan 20 anchor, hoping that it really does set as quickly as widely claimed. At 44lbs it is a little over-sized for my boat according to the Rocna anchor sizing chart but only by 10 lbs and frankly a heavier anchor is more secure, all things being equal. Anyway it is about the same weight of the existing Bruce which I will keep as a backup, on its old rode which still has plenty of life left. Combined with my Mantus storm anchor (which breaks down for storage) and the Fortress stern anchor, I think I have all the ground tackle a proper cruiser should have. Cats, what can I say? Apparently I've been feeding not just my cats but also a family of boatyard raccoons they've befriended, together they're eating me out of house and home. The interior of the cabin side over the starboard settee was bare fiberglass when I got the boat; there was only a splotch of gel coat. I had considered many options to cover up the area including just sanding it smooth and gel coating or covering it with the vinyl but I decided ultimately to do a proper job of insulating the hull, and again "might as well" do the v-berth too later. I don't expect to sail a lot to cold places since I hate the cold but since I have access, and may one day want to go to the Pacific Northwest, I might as well insulate now to minimize condensation. Next some closed-cell foam insulating sheets (3/4") were stuck to the hull between the furring strips using contact cement and I used a bottle to roll over the foam to make sure it got a good contact with the hull surface, in order to make sure there were no air gaps where condensation (and mold) can accumulate. Later, I covered the furring strips themselves with some neoprene tape though I don't think that was strictly necessary. Next I got some cedar tongue-and-groove boards that are used to line closets, stained and then sealed them with a few coats of gloss lacquer (which dries much faster than the traditional epoxy-varnish thought it doesn't result in as hard a surface -- the weather was too wet and cold for that), cut them to fit and screwed them into the furring strips using some brass slot screws (thank you Mike at Sailor's Exchange!) with finish washers. 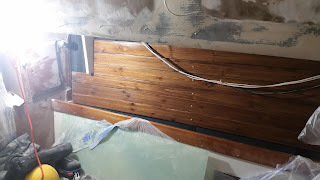 The project isn't totally done -- I have to to the top row of cedar planking still but I'm going to put that off until I re-bed the jib track screws that are around there but otherwise that's one thing checked-off the to do list! 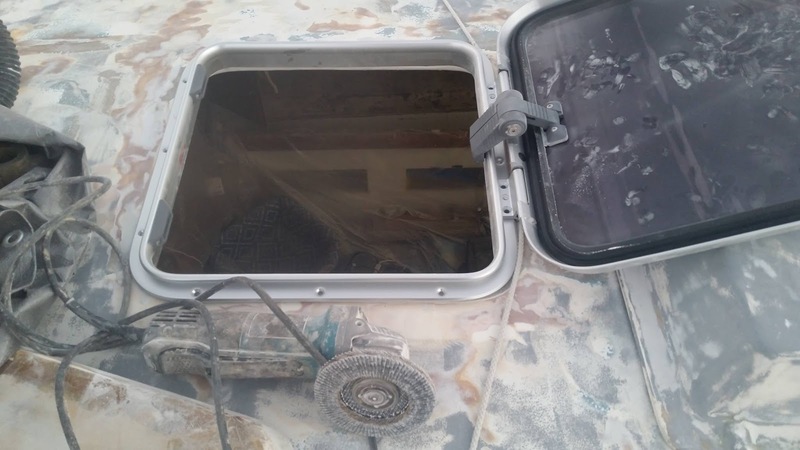 I decided to install a Lewmar low-profile size 20 hatch to ventilate the head compartment. The head will already have an opening portlight but the more ventilation, the better and there's no serious risk created by this hatch, so I figures why not. I made a point of getting hatches that have a flange rather than the Lewmar hatch models with a flat base, because I figure the flange provides a bit more security but also because the trim kit for the hatches only fit on the models with the flange base. Since I definitely want the fly screen attachment, I need to get the trim kits, and so I had to order the flange-base hatch. 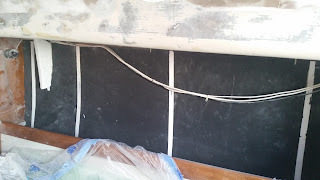 The installation process was pretty straightforward: make an outline of the hatch base on a piece of cardboard, and figure out where you want it to go from the interior, making sure that the hatch won't catch on anything (especially once opened) nor require cutting away electrical wires etc. Drill a hole through the center of the cardboard cutout straight up through the "ceiling" to the deck so you can then find the location of the hatch from the outside, and then line up the same cardboard cutout over the same hole from the outside (since the hatch is a symmetrical square shape, you don't need to keep track of the "inside" and "outside" of the cardboard cutout) and trace the outline for cutting the hatch hole on top of the deck. 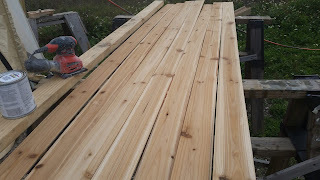 I used hole saws to make the corner cuts match the hatch, but if you're handy with a jig saw you can do the whole thing using only a jigsaw. 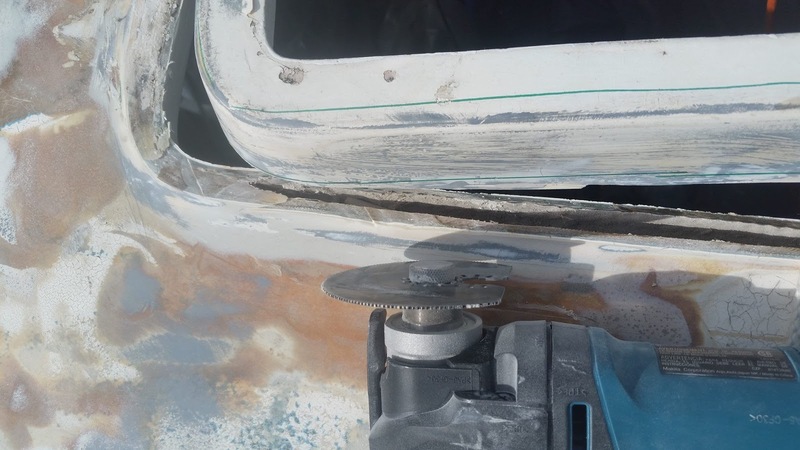 Because of the camber on the deck, there's a 1/4" gap around the sides under the hatch frame which, weather permitting, will have to be filled-in with shims and fiberglass filler to create a flat surface. 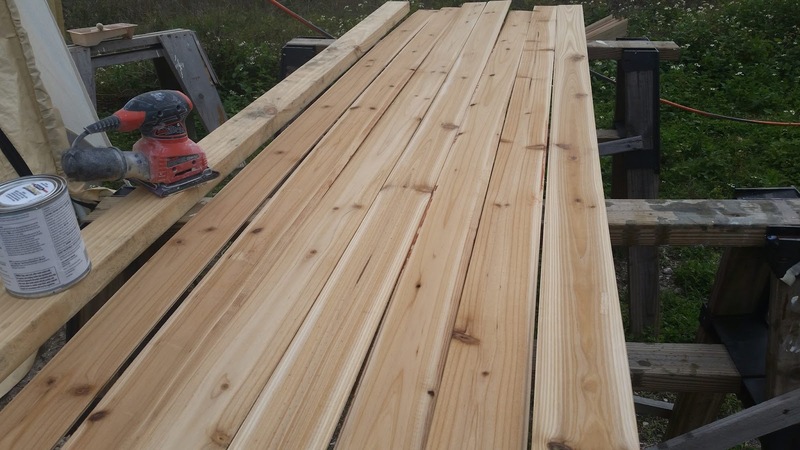 Having cut open the deck I was happy to see that it was more than an inch thick, and balsa wood in the core of the deck was in perfect shape. 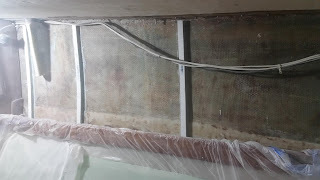 I dug the wood core out from for about an inch all the way around the interior of the new hatch hole using a chisel and oscillating tool, and then smothered the gap with filler and sanded it down smooth and flat. 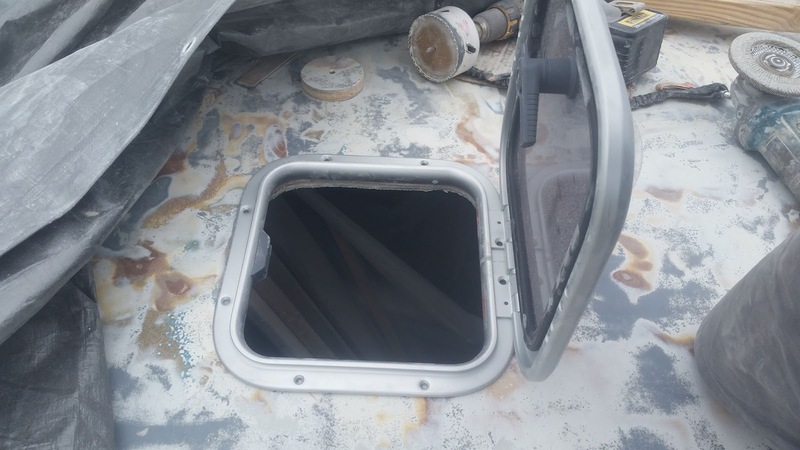 This ensures that no water can sneak into the wooden deck core from around the hatch hole to cause rot. Screwing down the hatch will require good weather but I don't think it will be necessary to through-bolt the hatch. Things can't simply be screwed into the deck as water will intrude into the wooden core from around the screw holes and cause rot. 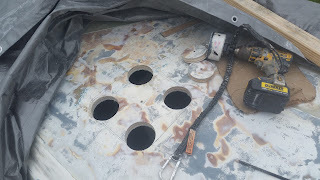 I bought 8x 1.25" number 10 Philips-head stainless screws to attach the hatch to the deck but first I will drill out the screw holes to a larger size, fill the holes with structural fiberglass filler and put the (wax-covered) screws into the screw holes along with the filler. 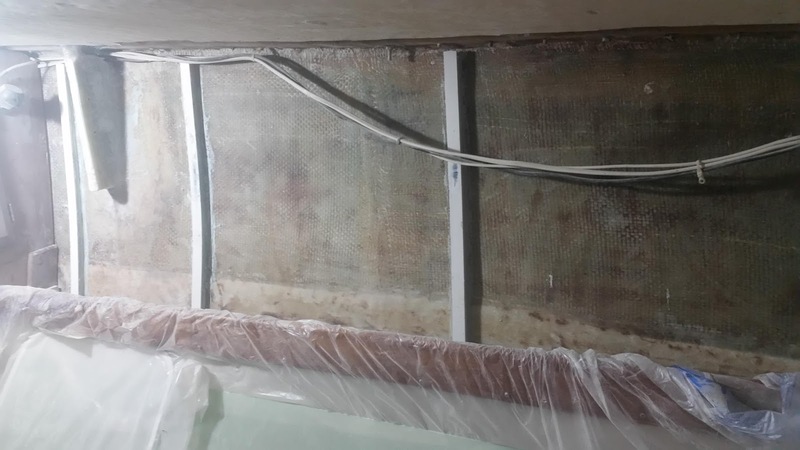 The wax will prevent the screws from getting stuck permanently into the filler once it sets but the fiberglass will take the impression of the screw threads well. 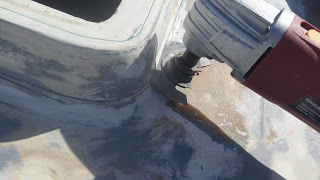 The idea is to let the filler set around the screws to give them a real solid "bite" to hold onto the deck top when I permanently install the hatch, and also keep out moisture. It has been unusually cold the last few days as a record-breaking "polar vortex" has covered the Midwest and we catch the tail end of such storms here in St Augustine, so I've just basically hibernated rather than work on the boat. Once the old hatch frame was cut off, you could see the gap between cabin liner and the external deck. I put some off-cuts of foam and wood in the gap, and filled it all with filler which I then sanded smooth and flush with the deck top. Then, it was simply a matter of finessing the fit of the hatch flange into the newly-enlarged hole. I had to sand down a couple of places around the new hole but the hatch flange dropped into the new hole without much trouble. The good thing was that since the new hatch is not much larger than the old one, I don't have to do a lot of fairing and finessing of the interior area around the hatch -- the hatch fills the pre-existing interior hatch frame in the ceiling quite well. Since the decktop is cambered, there is a slight gap of about a half-inch on the sides of the hatch frame with the deck top that I will have to fill-in with shims that are glassed in place. 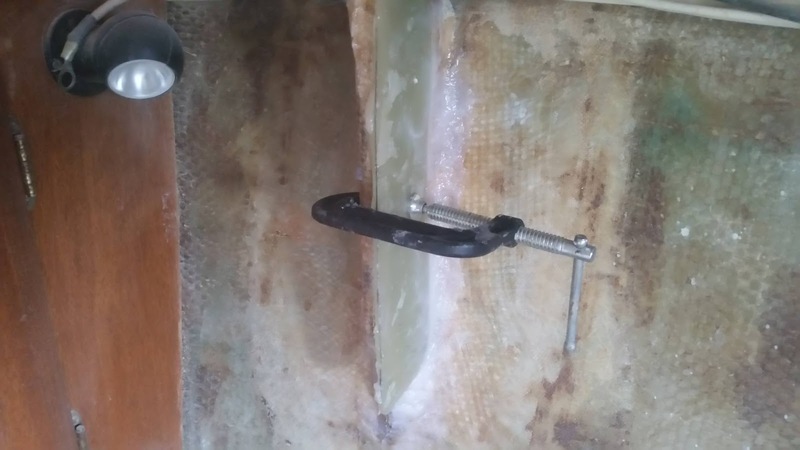 I also have to drill the screw holes for the new hatch, making sure to fill over-sized holes with resin to prevent any water intrusion around the new screw holes. 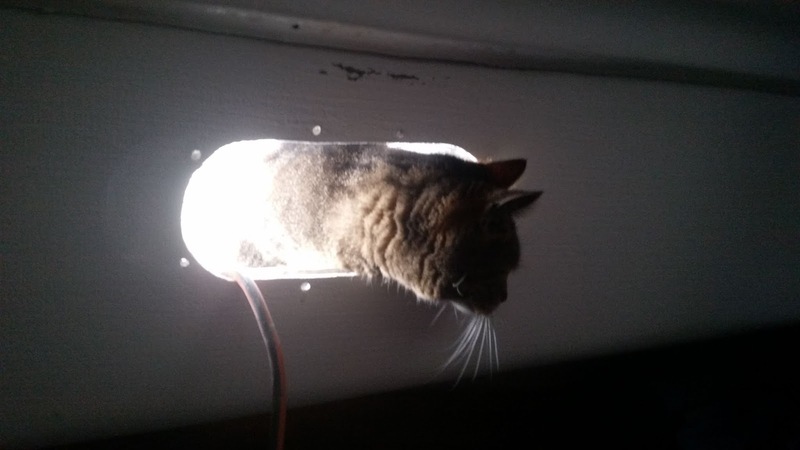 I also have to cut the 4.5 inch hole for the solar vent in the center of the hatch plexiglass. Next, installing the forward hatch.